In the midst of the name-calling and mudslinging of our politics today, it’s easy to forget that we ALL love our country. We may disagree on what’s best for our people, but we fight because we care. We fight because it matters to us. We fight because in spite of all our many problems, we’re still the best deal on the planet. Truth is, we must become free in our minds, souls, and spirits before we can have true freedom in this country. We must have the strength to say no to sick relationships, to manage our health, to get our finances in order. We must have the honesty to face our challenges and the willingness to do the work to overcome them. We must find ways to serve in our communities, because collaboration works and solves problems. We must learn to count our blessings and to help lift each other up. When we do this, then what our crazy politicians do matters less. It is We the People, after all. Together. Here I am with my new best friends. One of the novels I’m working on, Blood and Loam, is set in 1970, and my main character, Stella, has come home in a daze from Kent State, trying to escape the violence. Of course, she will face her own war when she returns to her hometown, so there’s no running away from turmoil. I was a kid when students marched and occupied school administration buildings to protest the Vietnam War. My only official protest occurred in high school a few years later when our teachers threatened to strike. A lot of us kids, in sympathy for our teachers, showed up at a school board meeting and disrupted it with our questions. We were angry, but nonviolent and asking sincere questions. The superintendent closed the board meeting to the public and called the state police, and we were ushered out. Some of us vowed to meet at the park on Saturday to discuss next steps, but I chickened out. I didn’t want to rock the boat. Signs were being made throughout the edges of the park. 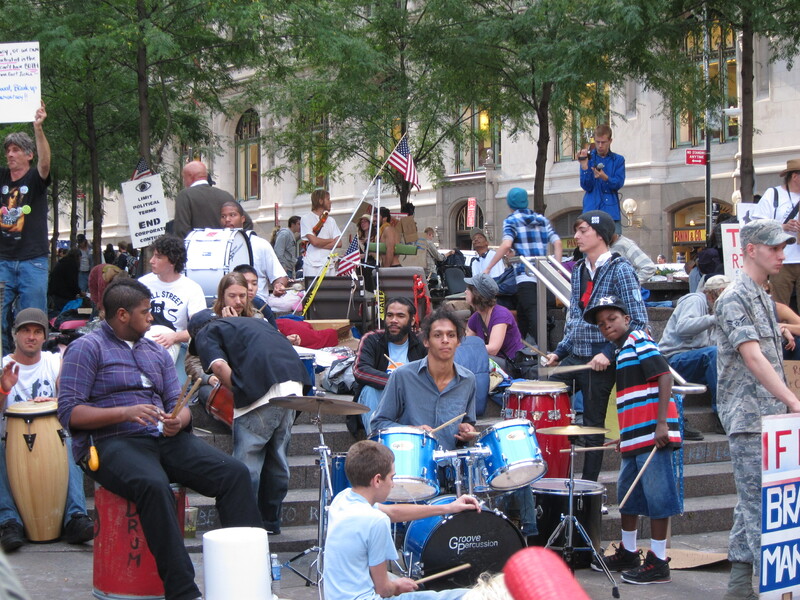 In Zucotti Park, a group of people, many (though not all) of them young, have taken a strong stand — and I’m not just talking about the fact that many haven’t showered in days. 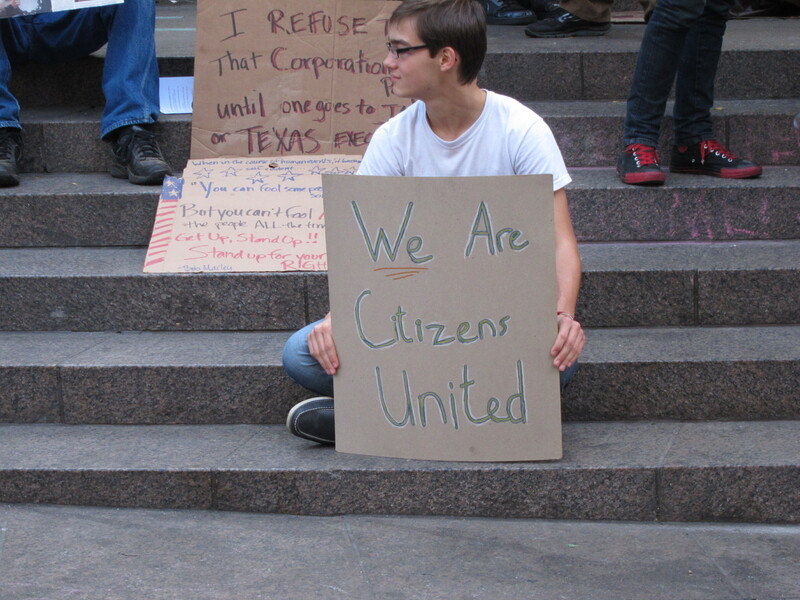 They are willing to demonstrate for their future, to draw attention to corporate greed and government corruption. While hubby and I have talked privately about these matters, and occasionally slipped some money toward a political campaign, we did not take the added step of publicly declaring our concerns and organizing others who felt the same way. As I visited with some of the young people, I saw that they are intelligent, thoughtful, and caring. We arrived early in the day, and some of the protesters were still sleeping, lined up in rows in the park. Others were walking around, chatting and making signs. A little while later, a row of drummers started playing. There was an unexpected order to the park. One section was a designated library. In others, we saw a press room, complete with power; a kitchen area with a sign requesting vegetables and vegan food; an area where people could get socks and gloves for keeping warm during the night; and a medical area. It looked like a microcosm of a town. The group acknowledges that they attract a wide range of people. Though the majority are young, and hence far more willing to spend days or weeks living outside, not all are. They even have their own newspaper, and one of the protesters gave me a copy of one. I read nothing “crazy” or even unrealistic in the paper, just newsy articles about the events going on. Some thanked us for our support and asked us to go back to our homes to share the reality of what we saw. I thanked THEM for having the courage to take a stand. Americans are angry about corporate greed an corruption within our government. We have discussed these same issues privately in our own homes, but it never occurred to us that we could do something about it. Yes, we grew passive as we grew older, bemoaning the status quo but not having the courage to take a public stand. Yes, these protesters have long hair, piercings, and tattoos, but they are exposing concerns that many of us have. It’s easy to “shoot the messenger,” but the message they are conveying is a valid one. I am reminded that back in the late 60s and early 70s, students were mocked for their appearance, but their protests made the war so unpopular that it did, I believe, make a difference. We can look back now and know that the hippies were right. We were present to hear the “mic check” communications that go on — where one person yells “Mic check!” to get attention, and his or her words are shouted down the line to the group. During our stay there, they were looking for legal aid representatives. One of the women was being arrested for writing “Good morning, NYPD” on the sidewalk with chalk. Seriously? That was the most disturbing part. The protesters were quietly talking and going about their business, not causing trouble. The police, on the other hand, seemed wired up and ready to confront. In fact, during one hubbub when we worked our way toward the action to see what was going on, Henry and I were briefly separated from each other. Worried that I was getting swept up into a mass arrest, I pulled back and turned around to look for him. A police officer brushed against me not once, but twice — and not because we were getting sandwiched together. I felt as though he was trying to either intimidate or provoke me. I pulled back to another area, getting as far away from him as I could, so I could call Henry. Fortunately, he found me at that moment, and we moved away from the action. 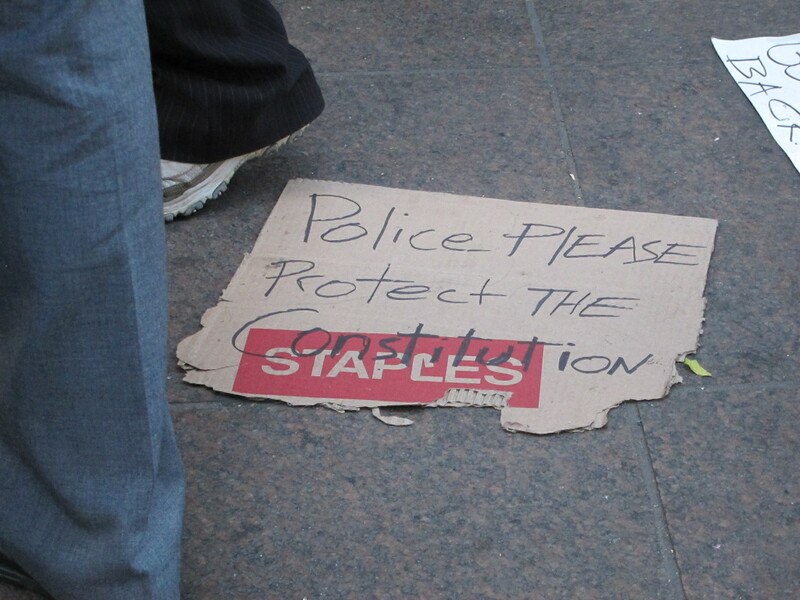 The protesters responded by inviting others to write on the sidewalk with chalk, a deliberate act of civil disobedience in solidarity with the woman who was arrested. We decided not to try our luck. I did not see the sanitation issues being reported in the media. I did see people cleaning up after themselves and loading up garbage bags. I did not see chaos, but rather an organized and thoughtful demonstration. I did not see evidence of the conspiracy theorists’ opinions that George Soros is funding the movement. If he is, he isn’t doing a very good job. People were relying on donated food and passed a bucket to get other needed supplies. The bucket I saw had a handful of $1 bills in it. “Spread the word,” one of them told me. “Go back to your city and tell everyone you know what you saw here.” I am doing that because I know that we are getting untruthful reporting in the mainstream media. It’s one thing to know that intellectually. It’s quite another to see it for myself, and I am sickened and disheartened at how sanitized the news has become. What else is going on that we haven’t learned about? I am a fortunate woman. I live in an affluent area of Houston and visited Occupy Wall Street after leaving the safety and comfort of a hotel room. In a few days I will go back to a life that is largely insulated from many of the problems our country faces. I no longer have to work at a job where annual pressure was brought to bear on employees to financially support the company’s PAC — and, of course, its Republican candidates. Still, we cannot sit idly by while our fellow Americans keep losing jobs, while our government gets increasingly bought and sold by corporate interests, and while those who brought the economy down receive special favors and corporate welfare. I am passing along what I have seen in hopes that these young people will, with enough voices raised in chorus, get the respect they are due for forcing attention to the many problems we as Americans all share. Will marching on Wall Street solve our problems? Of course not. 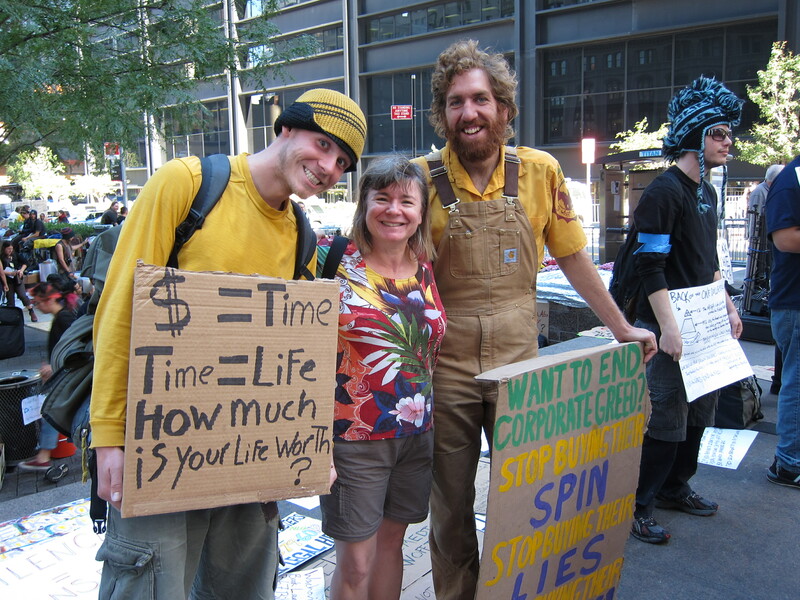 But if the attention called to our problems helps us shake off our apathy and vote, or to help grass roots service organizations keep going in a tough economy, or to defend our food supply by buying local and organic foods — in these ways and more, we are reminded by Occupy Wall Street that we can make a difference. We can make our country great again. We just have to fight a little harder. “Please don’t get arrested.” These were some of my stepdaughter’s parting words last night. We’re visiting New York City and feel the magnetic draw of the protests going on in Lower Manhattan, protests now being replicated in cities around the country and even the world. I’ve also been told by my kids to turn my music down. Of course, I don’t listen. I’m a Baby Boomer after all, and I grew up thinking that you can’t trust anyone over 30, and if it’s too loud, you’re too old. I’ve given up the former, having passed 30 decades ago, but it’s my kitchen and I’ll dance in it, dammit. Maybe I’m naive, but I’m not concerned about getting arrested. We took a preliminary look early yesterday as we wandered down to Washington Square Park, where protesters in the Occupy Wall Street movement held a meeting the day before (having relocated due to growing size). Not much was going on yet, though we did see a small band of young men marching with signs and chanting, “We are the 99%!” A number of park police were milling around, with other police cars circling. Interestingly, the Starbucks at the corner claimed its restrooms were out of order. The park was filled with young people waiting, with “Occupy” written in chalk on the concrete — near another sign with an arrow pointing to “Jam Sesh.” In the meantime, a father threw a football to his son. Other families brought their children to play, as though it was a typical Sunday. Later, I saw a woman about my age with a sign — she is one of the 99% — and more evidence that this is not just a movement for unemployed young people. When I needed to find a restroom, we had to walk several blocks away. I thought about the politics of bathrooms, recently described in one way in the book The Help, and now shown to me here, in this day and age, as a way to discourage protest. Hit people at the point of their basest needs. We eventually found a place that welcomed us as long as we purchased something — which I always do anyway. Inside one of the coffee shops, a group of young people were gathering. A sign outdoors invited people to come in and “join the movement. So, apparently not all business owners are disgruntled about the protesters — some welcome them. We left before the day’s main event — after all, our primary plan is to visit Sarah. We had a normal day in New York, taking in a Sunday matinee of the musical Follies with Bernadette Peters. How does that woman stay so gorgeous? She’s ten years older than I am. Sure, one can get “work done,” but she has the trim, fit figure of a woman much younger. And her voice is amazing. I wasn’t wild about the musical, but she’s fabulous. Today, though, we plan to head down to the protests. We attended last year’s Rally to Restore Sanity, and it feels as though Occupy Wall Street provides an outlet that the rally did not. While the rally provided plenty of entertainment and a spirit of solidarity, it was clear that something else wanted to happen, needed to happen, in order to shake up the status quo. A lot of younger people were disappointed that the rally didn’t provoke a movement, so they set up their own. Normally I’m not political here at A Woman’s Nest, but I would just like to say this: Americans, regardless of political affiliation, have the right to assemble and to demonstrate. The media first ignored the protests, and now have begun to villify the protesters. I have seen enough online to not trust what’s being reported in general, and I want to see for myself what is happening. Here’s what I do know: I am neither young nor a hippie. My husband and I are not on the dole in any way, shape or form…and yet I, too, worry about the infiltration of corporate interests into our government, including the Supreme Court. I get angry when I hear of hard-working Americans losing their jobs and then being treated as though it’s their fault. Yes, there are always people gaming the system, but I believe those represent the minority. I grew up in a household where manufacturing was the primary industry, and unions helped my father earn a living wage to support his family. Those people that I grew up with worked hard and were the backbone of this nation — so I know they are not the lazy bums that certain politicians would have you believe that they are. I have a sister who is a teacher, and I know that much of the nastiness in the media about teachers is not true, either. She works hard, including during the summer, and is a single mom. She tutors on the side to earn extra income, and has coached as well. She is hardly living high on the hog. I also know that unarmed people who have been corralled into a pen don’t need to be pepper-sprayed. This is why I need to see for myself what is happening at Occupy Wall Street. I am a proud American who loves my country and wants it to be better, and I support the passion of those who march in hopes that they can make a difference. And, in case you plan to ask me, I support that right for Tea Partiers, too, even though I find their politics distasteful. My plan has been to focus on “lightness” this month, but part of lightness is having freedom and a government that works for the good of the people, so I intend to explore more of that this week. At this point I don’t know how the blog will look — normally I have my book and blog recommendations and some sort of feature. I may or may not deviate from the plan this week. Sarah said, “Please don’t get arrested.” My friend Samantha said, “Please don’t get hurt.” I don’t plan on either, but if we’re writers, we can’t pass up a good story. This turmoil, this messy democracy, the cries of the people — none of it is “light.” But perhaps, as this group begins to find and articulate its message, we can see down the road a lighter future for our country. I hope so. My husband bought a hybrid bike some months ago and has recently taken it out on several long, hilly rides. After years of riding, he can move pretty fast. “You would really be something if you had a road bike,” people tell him. Well, he does, but he chooses the hybrid instead. For him, though, it’s not about how fast he can go. It’s about building strength and getting the heart rate up. I love this about him, this willingness to do what’s right for him versus what’s popular. I’m a little sensitive to that question. It takes time to write, to read the work of others, and to study the craft. There are days when the blank page intimidates and refuses to fill, days when the prose is boring, days, when plot problems don’t resolve. There are the works that change midstream, requiring a complete rewrite or even total destruction of what came before. Yes, often writers work day jobs out of necessity while they build their reputations, but it doesn’t come easily. After years of writing on my lunch hours while coworkers considered me antisocial, it’s nice to spend my days writing. I schedule my work as I did my previous jobs, with daily to-do lists and schedules to keep me on track. I have to limit phone calls and e-mails to avoid distractions. The good news and the bad news is that I am my own boss. I have a lot of ideas, and I’m doing my best to get them all on to the page. As I revise Change of Plans and Blood and Loam, a new manuscript, Another Ordinary Day, has popped onto the screen and demands some attention. I manage this blog and Art of the Garden. So when I get thrown off-track from time to time, I tend to fret. These past few days I have lived with some severe fatigue. A new gym opened up down the street, and I overdid it, I’m afraid. Some years ago I had some health problems that, while healed, still cause my body to complain from time to time, and I have to focus on sustained, consistent effort rather than the “no pain, no gain” philosophy. This last week I pushed a little too hard, and now I’m paying the price. I used to hate these enforced periods of stillness, but now I see great value in them. I can’t just spit out pages of new prose…I can focus only on one sentence at a time. This slows down the page count, but strengthens the sentences. As I rest and stare off into space, my characters come to visit. We have a leisurely lunch at a French restaurant rather than a quick run through the McDonald’s drive-through and as a result, I get a clearer picture of their wants and needs. I let go of my idea of the story in favor of what the story wants. Also in these moments, I ask myself the hard questions about my life. Am I living authentically? What do I want from this writing life? What matters most? I’ve discovered, to my surprise, an inner voice that wants me to continue working independently, as opposed to seeking traditional publication. Now, I want to make sure this comes from a genuine desire for independence, and not fear of rejection. So I go through the exercise of sending queries, and just this morning I signed up to meet with an agent in June at a conference. I intend to continue the process for a while to test this new information. Part of me wants the “validation” that traditional publishing provides, even though I’ve read some awful books that make me wonder how they were ever chosen. There are people who believe that self-publishers do so because no one will have them. Yes, that’s true in many instances, but I also know several talented, though unpublished, writers. But does that matter to me? Truth is, I write for the same reason that I breathe. I can’t live without the words any more than I can live without air. I never cared about fame or getting on the bestseller lists. It’s more about expressing myself and hoping to find some people who like to read what I write. Sharing the writing is my way of interacting with the world and building relationships. Do I need a publisher for that? Not really. Some years ago I participated in a cognitive therapy program to help me work with anxiety issues. As part of that program, I had to keep a journal, which my therapist then reviewed and returned to me the following week. In the margins of some of my entries she wrote “WPT,” or what people think. She pointed out the many ways that I would stray from my soul’s path because I was concerned about someone else’s opinion of it. Over time, I learned that I still care what people think, but I can still choose actions based on my needs, desires, and personal truth. I may be surprised. I may go to Austin and fall in love with the idea of getting an agent and going the traditional route. I suspect, however, that I will choose to stay independent. I think it works better for my personality and way of going through life. It’s the hybrid versus the road bike. Neither is “wrong,” but one suits us better than the other.